In terms of employment growth, sectors outside of farming have been the major beneficiaries of agricultural exports in the past dozen years. Starting around 2004, a divergence appears between the estimated numbers of farm and nonfarm jobs, with the latter accounting for a rising share of total employment supported by agricultural exports. Did you know that the United States is the world’s second largest agricultural exporter after the European Union? 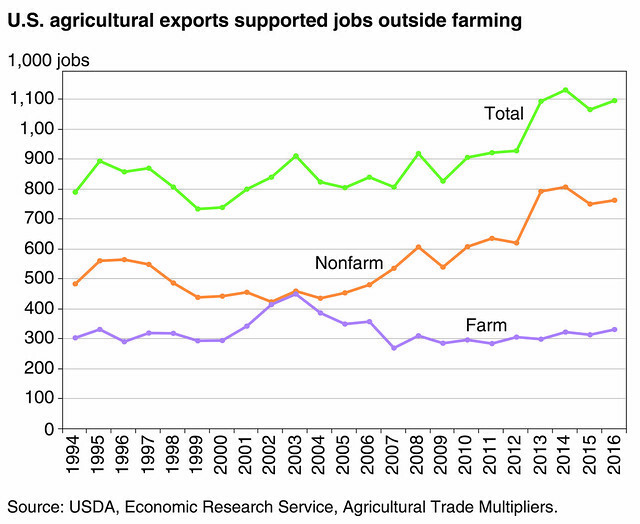 Agricultural trade supports American jobs and spurs non-farm economic activity. In 2016, U.S. agricultural exports required over one million full-time civilian jobs, including 764,000 jobs in the nonfarm sector. Each dollar of U.S. agricultural exports supported an additional $1.28 in farm and non-farm business activity. Moreover, U.S. agricultural trade surplus has historically helped to offset some of the trade deficit in non-agricultural sectors. Understanding agricultural trade trends, opportunities and challenges help inform policy decisions on trade. That is why the Economic Research Service (ERS) conducts research and analysis on the economic and policy factors underlying U.S. and global agricultural trade. Some ERS reports are broad in scope, focusing on factors that affect the international competitiveness of the U.S. food and agriculture sectors. The Global Landscape of Agricultural Trade, 1995-2014 explores growth and change in global agricultural trade and ways in which key policies have affected global trade patterns. During the last two decades, global agricultural trade volume has risen over 3.5 percent per year, and five countries—Brazil, Russia, India, Indonesia, and China—account for much of that increase in trade due to rising incomes and productivity growth. Other ERS research focuses on the export potential of key emerging markets and agricultural commodities of interest to U.S. producers. For example, India is the world’s largest producer and consumer of milk and has the world’s largest dairy herd. A recent ERS report, India’s Dairy Sector: Structure, Performance, and Prospects, finds that future production prospects depend heavily on productivity gains, primarily through improved breeding and feeding practices, and demand for feeds and improved genetics may offer opportunities for increased trade. Another recent ERS report, China’s Foreign Agriculture Investments, explores alternative motivations of China’s overseas investments in agriculture and their implications for U.S. agricultural exports to China. In addition, ERS works with USDA’s Foreign Agricultural Service (FAS) to provide quarterly forecasts for agricultural trade in the United States. These forecasts of current and next year U.S. exports and imports cover major agricultural commodities. ERS’s Foreign Agricultural Trade of the United States (FATUS) data provide monthly estimates of U.S. agricultural imports and exports—both value and volume—by country and commodity. Using U.S. farm-cash-receipts data, ERS also estimates annual U.S. agricultural export values by State and commodity. To learn more about agricultural trade, visit the International Markets & U.S. Trade section of the ERS website and view a presentation on The Global Landscape of Agricultural Trade. 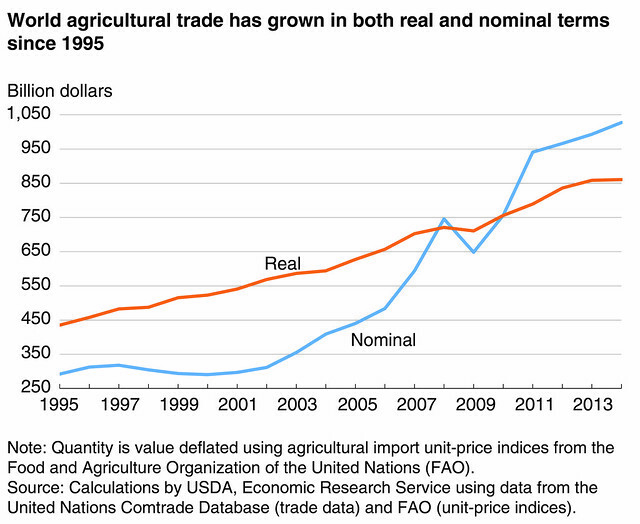 Between 1995 and 2014, world agricultural trade more than tripled in nominal terms (not adjusted for inflation) and nearly doubled in real terms (adjusted for inflation). Key factors driving this expansion include a more than 25-percent increase in the world’s population and about a 75-percent increase in the real size of the world’s economy. Other factors have also stimulated agricultural trade, including falling trade barriers and technological advances in agricultural production, transportation, information, and communications.